Last week, I spoke about how to questions and applying them to program planning, evaluation design, evaluation implementation, data gathering, data analysis, report writing, and dissemination. I only covered the first four of those topics. This week, I’ll give you my favorite resources for data analysis. This list is more difficult to assemble. This is typically where the knowledge links break down and interest is lost. The thinking goes something like this. I’ve conducted my program, I’ve implemented the evaluation, now what do I do? I know my program is a good program so why do I need to do anything else? YOU need to understand your findings. YOU need to be able to look at the data and be able to rigorously defend your program to stakeholders. Stakeholders need to get the story of your success in short clear messages. And YOU need to be able to use the findings in ways that will benefit your program in the long run. Good. This list still applies, especially the read part. Here are the readings for data analysis. First, it is important to know that there are two kinds of data–qualitative (words) and quantitative (numbers). (As an aside, many folks think words that describe are quantitative data–they are still words even if you give them numbers for coding purposes, so treat them like words, not numbers). Citation: Miles, M. B., & Huberman, A. Michael. (1994). 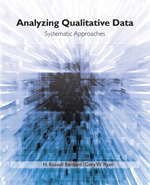 Qualitative data analysis: An expanded source book. Thousand Oaks, CA: Sage Publications. Fortunately, there are newer options, which may be as good. I will confess, I haven’t read them cover to cover at this point (although they are on my to-be-read pile). Citation: Saldana, J. (2009). The coding manual for qualitative researchers. Los Angeles, CA: Sage. Bernard, H. R. & Ryan, G. W. (2010). Analyzing qualitative data. Los Angeles, CA: Sage. If you don’t feel like tackling one of these resources, Ellen Taylor-Powell has written a short piece (12 pages in PDF format) on qualitative data analysis. There are software programs for qualitative data analysis that may be helpful (Ethnograph, Nud*ist, others). Most people I know prefer to code manually; even if you use a soft ware program, you will need to do a lot of coding manually first. Quantitative data analysis. Quantitative data analysis is just as complicated as qualitative data analysis. 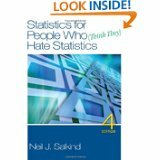 There are numerous statistical books which explain what analyses need to be conducted. My current favorite is a book by Neil Salkind. Citation: Salkind, N. J. (2004). 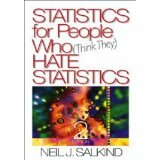 Statistics for people who (think they) hate statistics. (2nd ed. ). Thousand Oaks, CA: Sage Publications. NOTE: there is a 4th ed. with a 2011 copyright available. He also has a version of this text that features Excel 2007. I like Chapter 20 (The Ten Commandments of Data Collection) a lot. He doesn’t talk about the methodology, he talks about logistics. Considering the logistics of data collection is really important. Also, you need to become familiar with a quantitative data analysis software program–like SPSS, SAS, or even Excel. One copy goes a long way–you can share the cost and share the program–as long as only one person is using it at a time. Excel is a program that comes with Microsoft Office. Each of these has tutorials to help you.